Police are appealing for witnesses following a robbery in Milton Keynes. At around 7.30pm on Saturday (April 6), the victim, an 18-year-old man, was walking across the overbridge from Downs Barn in the direction of Campbell Park when he was stopped by two men. One of the men asked the victim if he could use his phone and grabbed it from his hand. The offenders then threaten the victim with a knife and took his wallet and house keys. The two men then ran from the scene. 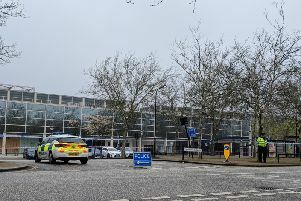 Investigating officer, Detective Constable Kerry Mitchell, based at Milton Keynes police station, said: “This was an unprovoked attack that has left the victim shaken. Thankfully he was not injured. “I am appealing for anyone who may have witnessed this incident to please come forward. “If anyone has information that could assist us with our investigation, please call the non-emergency number 101, quoting reference ‘43190104712’ or make a report online. “Alternatively, you can make an anonymous report to Crimestoppers on 0800 555 111." > An 18-year-old man from Milton Keynes was arrested on suspicion of robbery. He has been released under investigation. > A 17-year-old boy from Bletchley was arrested on suspicion of robbery. He has been released under investigation.